After rising for decades, the share of U.S. babies born to unmarried women has stabilized in recent years, driven by a sharp decline in births outside of marriage among foreign-born women, and a leveling off among U.S.-born women. In the newest available data (2014), a third of all births to foreign-born mothers were to unmarried women – down from a peak of 37% in 2008. At the same time, the rate has held steady for U.S.-born women and now stands at 42%, according to a new Pew Research Center analysis of government data. 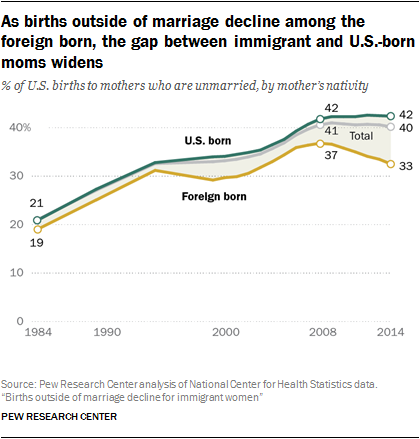 The share of babies born to unmarried mothers has consistently been higher for U.S.-born women than for immigrant women. However, the roughly 10-point gap1 between the two groups in 2014 is the largest disparity since birth data by nativity and marital status became available 30 years earlier. The share of all babies born to unmarried women in the U.S. stood at 40% in 2014, down marginally from 41% in 2008, according to the National Center for Health Statistics. Thirty years earlier, just 21% of babies were born to unmarried women. The decline in births outside of marriage among the foreign born is being driven, in part, by the changing regions of birth of new foreign-born mothers. The share of babies born to moms from Latin America has declined, while the share of babies born to moms from regions such as Asia has increased. New foreign-born mothers from Latin America were roughly four times as likely as moms from Asia to be unmarried in 2014. The shifting origins of new immigrant mothers are due in part to the decline in the number of recent U.S. immigrants from Latin America, which has been driven largely by post-recession declines in Mexican immigrants, and to dramatic birth rate declines among Hispanic immigrants in the wake of the Great Recession. Plummeting fertility rates among unmarried foreign-born women are further contributing to the declining share of babies born outside of marriage for this group. In 2014 the birth rate (the annual number of births per 1,000 women of childbearing age)2 for unmarried immigrants was 60.4. This is down from 90.0 in 2008 – a drop of 33% in just six years. Fertility among married foreign-born women also declined during this period marked by the onset of the Great Recession, but by a relatively modest 10%, from 115.1 to 104.0. In 2014, U.S. births to foreign-born women from Latin America were more likely to occur outside of marriage than those to U.S.-born women (48% vs. 42%). However, U.S. births to foreign-born women from most other regions of the world were less likely to occur outside of marriage than those to U.S.-born women. Foreign-born mothers have not only helped to curb the share of babies born to unmarried mothers in the U.S., but they are responsible for the nation’s long-term growth in annual births as well. This growth has been driven entirely by the increasing numbers of babies born to immigrant women. In 2014, immigrant women accounted for about 901,000 U.S. births, which marked a threefold increase from 1970 when immigrant women accounted for about 274,000 births. 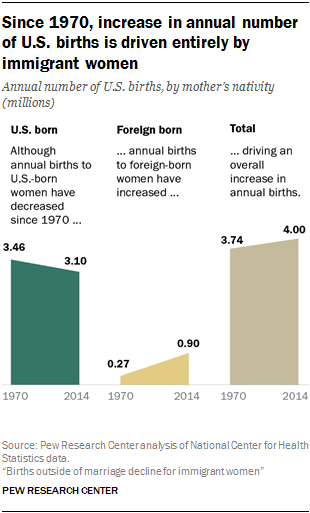 Meanwhile, the annual number of births to U.S.-born women dropped by 11% during that same time period, from 3.46 million in 1970 to 3.10 million in 2014. The increasing number of births to foreign-born mothers reflects more than just the long-term rise in migration to the U.S. In other words, it isn’t just the fact that more immigrant women live in the U.S. now than in the past, it’s that these women are having disproportionately more children than their U.S.-born counterparts. In fact, since data on nativity of new mothers became available in the 1970s, this has consistently been the case. For example, in 2014, 14% of the population was foreign born while 23% of newborns had foreign-born moms. The relatively high birth rates of foreign-born women – which have bolstered the overall U.S. fertility rate – have played a key role in the high share of babies born to foreign-born women. In 2014, there were 58.3 births for every 1,000 U.S.-born women of childbearing age, and 84.2 among their foreign-born counterparts. Birth rates for both groups have declined since 1970, but the 2014 rate for foreign-born women is about the same as the rate for U.S.-born women four decades earlier. Compared with U.S.-born women, birth rates are higher for foreign-born women from each region of the world. For example, women originally from sub-Saharan Africa have by far the highest annual fertility, with 106.4 births per 1,000 women of childbearing age4 The rate for Latin Americans, who account for more than half of births to immigrant mothers in the U.S., is 80.6. According to Census Bureau data for 2011-2014,5 the vast majority of foreign-born new mothers in the U.S. are long-term immigrants. 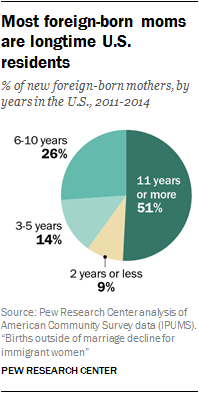 Fully half (51%) of those who had a baby in the preceding 12 months have lived in the U.S. for at least 11 years. Just 9% are recent immigrants, having come to the U.S. within the preceding two years. New mothers originally from the Middle East and North Africa are the most likely to be recent immigrants – about one-in-five (21%) are. Conversely, just 6% of new mothers from Latin America are recent immigrants. In terms of financial well-being, new foreign-born mothers are less well-off than their U.S.-born counterparts – a pattern reflective of broader nativity differences in the country. While median family income for new U.S-born moms is about $51,200 annually, this figure is $41,300 for new foreign-born moms. And while about 26% of new U.S.-born mothers live in poverty, this share rises to 31% for foreign-born new mothers. As with any profile of the foreign born, though, it’s worth noting the large variation in economic well-being by the mother’s region of birth: Foreign-born new mothers from Latin America are more than four times as likely to be living in poverty (42%) as those from North America (9%),6 for example. These nativity differences in economic well-being stem in part from the lower than average educational attainment of foreign-born mothers. Most notable is that immigrant new mothers are more than twice as likely as U.S.-born new mothers to lack a high school diploma (27% vs. 12%). Immigrant mothers also are less likely than the U.S. born to have some college experience (21% vs. 35%). Similar shares of both groups have a high school diploma but no further education (23%), or a bachelor’s degree (29% for the foreign born, 31% for the U.S. born). In 2014, about 275,000 babies were born to unauthorized-immigrant parents in the U.S., accounting for about 7% of all U.S. births, and 32% of all U.S. births to foreign-born mothers. The share of new mothers who are teenagers is higher among the U.S. born (6%) than among the foreign born (2%), regardless of the region of the world in which they were born. U.S.-born new mothers are less likely to be ages 35 or older than foreign-born mothers from most regions of the world. While about 18% of U.S.-born mothers are in this age range, the share is about twice as high for foreign-born moms from elsewhere in North America or from Europe or Asia. Although births to Mexican-born women have declined in recent years, they still accounted for 32% of all U.S. births to foreign-born women in 2014, up from 20% in 1970. 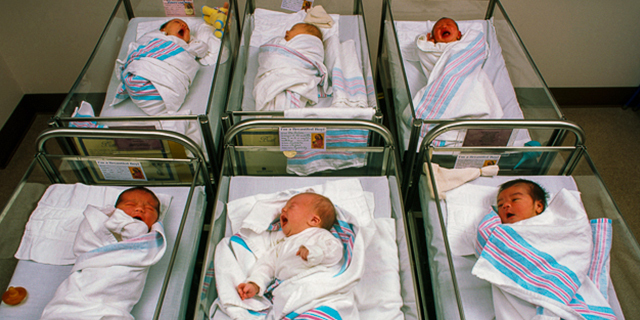 Mexican-born mothers accounted for 7% of all U.S. births in 2014. More than half of all babies born to foreign-born women in the U.S. are to those from nine countries and one U.S. territory:7 Mexico, China, India, El Salvador, Guatemala, the Philippines, Honduras, Vietnam, Dominican Republic and Puerto Rico. Among new foreign-born U.S. mothers from the top 10 sending locations, those from India stand out for their low share of births outside marriage (1%), high rates of college degree attainment (87%), and high annual family incomes ($104,500). At the opposite end of the spectrum, new mothers from Honduras stand out for the high share who are unmarried (66%), lack a high school diploma (51%) and are living in poverty (49%). National Center for Health Statistics (NCHS) data derived from U.S. birth certificates. American Community Survey (ACS) data based on all women ages 15 to 49 who have given birth in the U.S. in the 12 months prior to the survey. The NCHS data allow for trend analysis back to 1970 but include only a handful of relevant maternal characteristics based on the time of the birth. Analyses of mother’s nativity, country of birth and marital status are derived from the NCHS data. The ACS data do not offer a long time horizon but do include data on many maternal characteristics not available through NCHS data such as educational attainment, financial well-being and years spent in the U.S. All analyses other than those focused on mothers’ nativity, country of birth and marital status are derived from the ACS data. For more details on each dataset, please see the Methodology. This report is organized as follows. The first chapter provides an overview of trends since 1970 in U.S. births and birth rates among U.S.-born women and foreign-born women. The following chapter zeroes in on the trend since 1984 in births outside of marriage, and what factors may be contributing to the growing gap in births outside marriage between U.S.-born and foreign-born women. The third chapter examines differences by mother’s nativity and region of birth on a number of other demographic and economic characteristics, including age, race, education, employment, financial well-being, years in the U.S. and English language skills. The last chapter examines the economic and demographic profiles of new mothers who were born in one of the nine countries and one U.S. territory accounting for the largest share of new U.S. foreign-born mothers. “Births” refers to live births occurring in the calendar year in the U.S. Except where noted, all variables, including race and ethnicity, are based on the characteristics of the mother, not of the father or the baby. Any births to mothers born in one of the 50 states or the District of Columbia are defined as births to “U.S.-born” women in analyses based on National Center for Health Statistics (NCHS) data. Births to women born elsewhere, including Puerto Rico and other U.S. territories, are counted as births to “foreign-born” women. For American Community Survey (ACS) and census analyses based on women who gave birth in the preceding 12 months, “U.S. born” includes those who were born in one of the 50 states or the District of Columbia, or who were born abroad to at least one American parent. All others are classified as “foreign born,” including those born in Puerto Rico and other U.S. territories. The foreign born in these analyses comprise both authorized and unauthorized immigrants. A mother’s marital status is based on when she gives birth. Any mother who reports that she is married is classified as such, regardless of whether she is married to a man or a woman. Racial references to whites, blacks and Asians include only those who are non-Hispanic. Hispanics are of any race. “Some college” includes those with a two-year degree or those who attended college but did not obtain a degree. “High school” refers to those who have attained a high school diploma or its equivalent, such as a General Education Development (GED) certificate. A mother’s educational attainment is based on when she is interviewed for the ACS. A mother’s age, employment status, income level, poverty status, English language skills and years in the U.S. are all based on her characteristics at the time she is interviewed for the ACS.